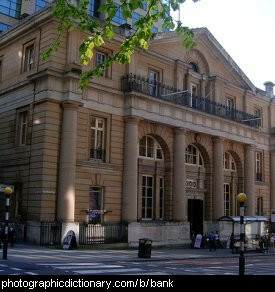 Financial words.All sorts of words that relate to money and finances. 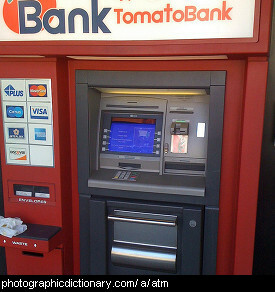 An ATM is an Automatic Teller Machine. You put your keycard or credit card into it to deposit or withdraw money. 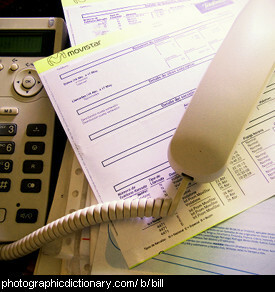 A bill is a document that says how much money needs to be paid for some goods or services. It might also mean paper money, like a twenty dollar bill. It might also be another word for a bird's beak. It is also a shortened form of the name William. You borrow something when you take it from someone else with their permission and return it to them when you have finished with it. 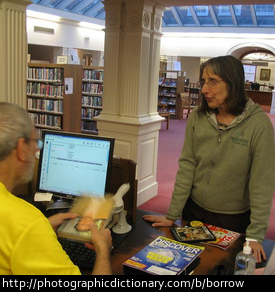 People often borrow books from a library. 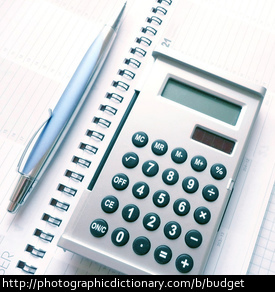 A budget is a document where you keep track of the amount of money you have coming in and going out. You might make a budget to keep track of your expenses when you are trying to save up to buy something. You buy something when you give someone else some money in exchange for it. 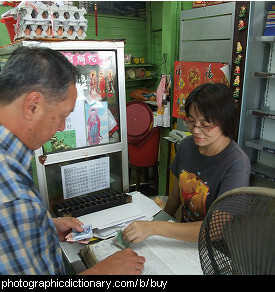 The man in the picture is in a shop buying some goods. The opposite of buy is sell. The past tense of buy is bought. 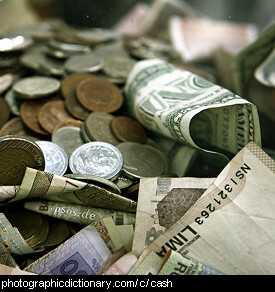 Cash is money in the form of coins and notes that you can hold in your hand. 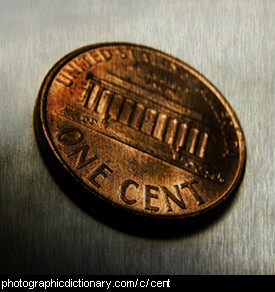 A cent, also called a penny in some countries, is one hundredth (1/100th) of a dollar. 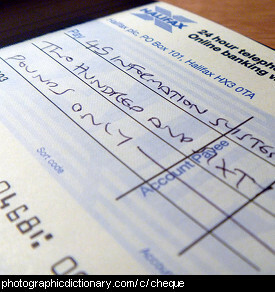 A cheque, also spelt check in some countries, is a special piece of paper that represents an amount of money. It has information on it saying which bank account the money comes from, who owns the account and how much money it represents. 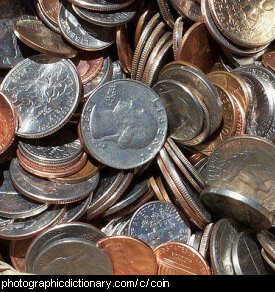 Coins are a type of money that are round and made from metal. Coins usually have the date they were made, the country they are currency of, the amount of money they are worth and some pictures of people or animals stamped on the sides.